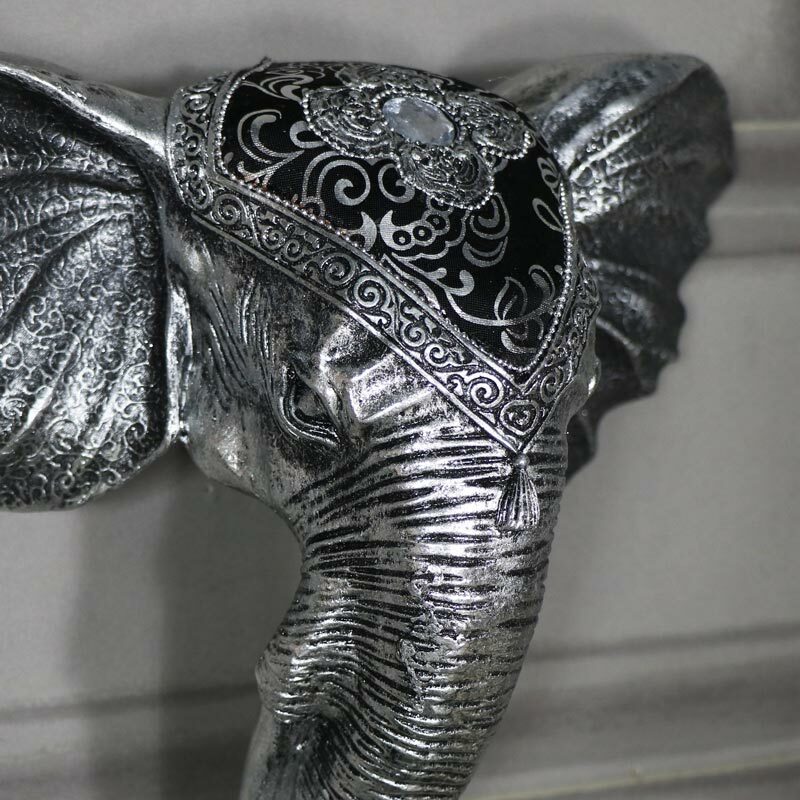 Add a look of the exotic safari to your home with this wonderfully ornate silver wall mounted elephant head. Lovingly detailed design that will look amazing hung in your living room or hallway. With a distinctly exotic look that will make a great focal point and fantastic conversation piece. Scrolled detailing etched into the ears and an intricately detailed, jewelled headpiece. This is an ainmal head with a difference and will fit in with any modern, contemporary or traditional decor. With so many more animal heads to choose from. With the exotic to the rustic which also make a more animal friendly way to decorate your home. 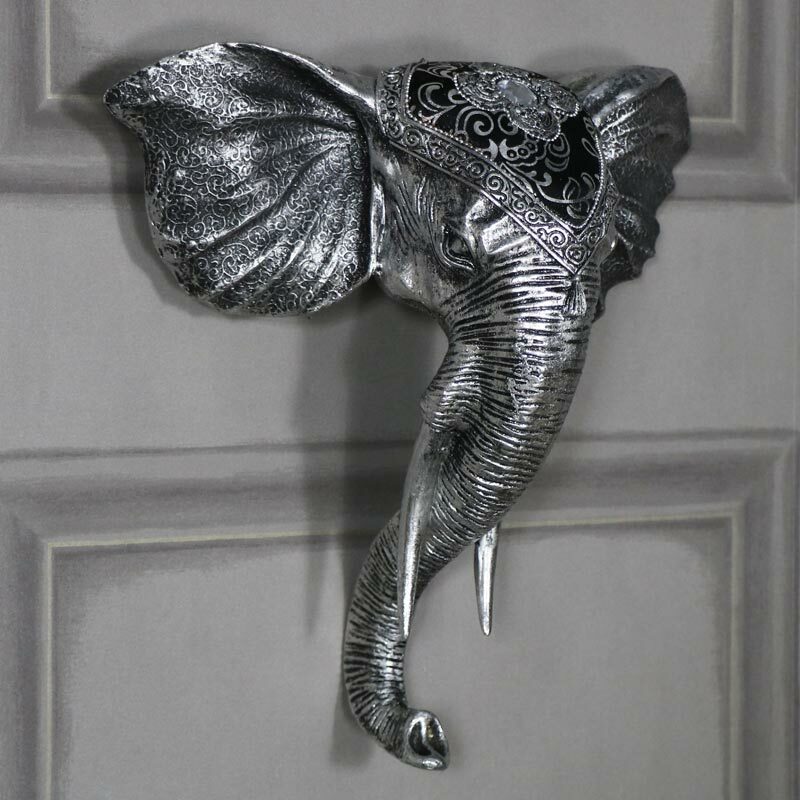 Add a look of the exotic safari to your home with this wonderfully ornate silver wall mounted elephant head. Lovingly detailed design that will look amazing hung in your living room or hallway. With a distinctly exotic look that will make a great focal point and fantastic conversation piece. Scrolled detailing etched into the ears and an intricately detailed, jewelled headpiece. This is an ainmal head with a difference and will fit in with any modern, contemporary or traditional decor. With so many more animal heads to choose from. With the exotic to the rustic which also make a more animal friendly way to decorate your home. Made from resin and finished in a silver colour with black embossed detailing. Lightweight design that is easily wall mounted with hole on the back for hanging.